Your personal year, from a birthday to the next one, is analyzed according to your solar return chart. This annual report is based on the analysis of your birth chart with its planetary positions in signs, houses and aspects and the analysis of superimpositions and interaspects of planets and houses in the birth chart. This study of the solar return is a keeper and you can use it anytime in order to control your destiny. 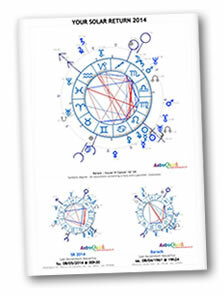 This astrological study of about 20 to 30 pages includes all birth and solar return charts in color. starting from only 3544 JP ¥, including many charts !